Ramat and Snowgum Lodges are just over a kilometre from the centre of Niseko Hirafu Village, which is the main village of the world famous Niseko ski fields. The free Grand Hirafu shuttle runs daily between 8.30am – 8.30pm with the closest stop only 150m from the lodge (yellow dot stop 26) and only takes 5 minutes to get you to the gondola and about 7 minutes to the Welcome Centre. We also run an in-house first tracks shuttle service to get you to the ski lifts (only 2km away) for fresh tracks every morning. 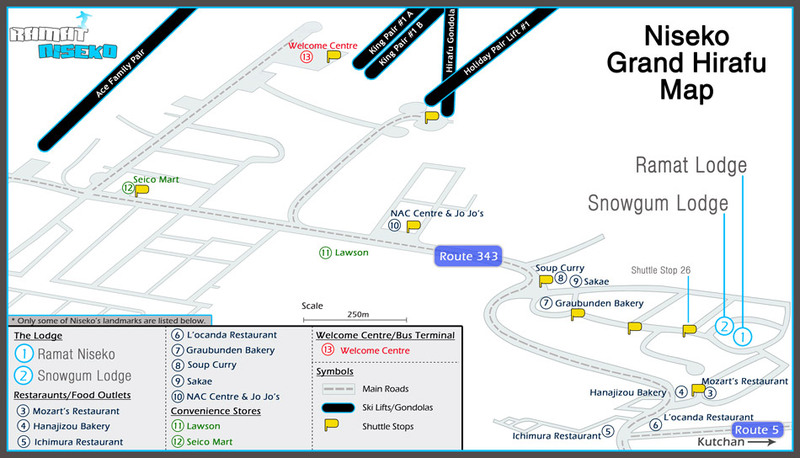 Have a look at our getting around page to see how easy it is to get around Hirafu Village. What cooking facilities are at Snowgum lodge? A fully-equipped commercial grade kitchen is available for you to use to prepare and store your favourite foods & snacks.